It was a flight from Phoenix to Philadelphia that we’d nearly missed, having been delayed hours and hours in California’s early dawn moments. We had a simple day planned and the connections made sense, until the plane we were supposed to take from Ontario airport was struck by lightning and our sensible day burned up with it. As we all know, airports are the physical embodiment of internet comments sections, and the other passengers took advantage of the delays to test how well the acoustics accommodated their shouts. The anchorwoman on a too-quiet TV was asking if kids these days (Kids These Days) got too many trophies and, if so, what we should do about it. Some man was talking back at her, confirming that Kids These Days feel too accomplished for their own good and ten other thesis statements from thinkpieces your aunt shared on Facebook. We give kids too much and it ruins America. This will be relevant later, when I become unbearably sad. The air itself was stressful, and the airplane no less. We boarded hours late and I slept through the landing. My travel partner woke me up and we returned to stress sans adrenaline, a rather inconvenient combination when you’re trying to catch a plane that was scheduled to depart two hours ago. By the grace of the Airport Deity, this plane, too,was leaving late, late enough that two girls with short-to-average legs could dash from two terminals away and still get in with boarding group B.
I’d already decided that the whole lightning incident was a sign, that the universe hadn’t wanted us to make the connection and also that I was buying into the idea of the universe sending signs. This plane wasn’t meant for us, nor we for it; yet here we were in row 12 trying to ignore the three babies that had already started to cry. I wasn’t one of them, but I wanted to be. Convinced that the flight was doomed to crash, I shrank into my seat as we took off for a 5-hour ride. In another terrible twist of fate, we had a chatty crew. They all seemed to be great friends, and I hated them with every fiber of my doomsday-oriented brain. They made trivial announcements every half hour, setting off the intercom each time with a ding that told my heart to prepare for imminent death. At one point, I remembered that you can see out of the windows of planes. This did nothing to convince me that we weren’t falling, even though I saw level skies above and below us. I concocted a plan for how we could escape the debris of our plane. I decided I’d shelter my travel companion with my book bag and lie down on the floor so that if the roof caved in — because in my incredibly realistic and likely scenario, crash-landing on the ground meant that the roof would fall in before the floor broke up — I’d be safe. We’d get out through the window, somehow. Figuring out how to break the windows was going to be an issue, but I decided that my fight-or-flight responses would kick in to guide me at the moment of the crash. I hoped that the plane’s fight or flight reflexes would also kick in and that it’d choose flight. Then the lights went off. The ding I hated showed up again, and the crew asked everyone to close their window shades. With light from the sky cut off, the plane was completely dark. I though about the good old days, back when looking out the window was something I took for granted, and also when I wasn’t absolutely, beyond-a-doubt sure that I was about to die. The intercom dinged again. My heart attacked itself, cut my entire circulatory system into tiny bits, then jumped out of my body. At least that’s how it felt — it might have actually done that, but I couldn’t check because I was busy riding the LIGHTS-OFF-DEATH-PLANE to Hell. I hated the crew, I hated myself, I decided that I could use a lighter to melt the windows when the time came to escape, if need be. The crew followed up on that insufferable ding, telling us that they had a “very special announcement” to make “on this very special day.” Now I was convinced that they were going to shoot us and then we were going to crash. People that chatty are always hiding something, and it’s usually guns. We didn’t die. We didn’t even fall out of the sky a tiny little bit. There was no crisis, just a toddler’s birthday. I didn’t cry then, not from relief when they asked us to sing Happy Birthday instead of reading us our last rites, but I did cry when they turned on the exit lights so that they could bring the kid a “cake” made out of toilet paper. 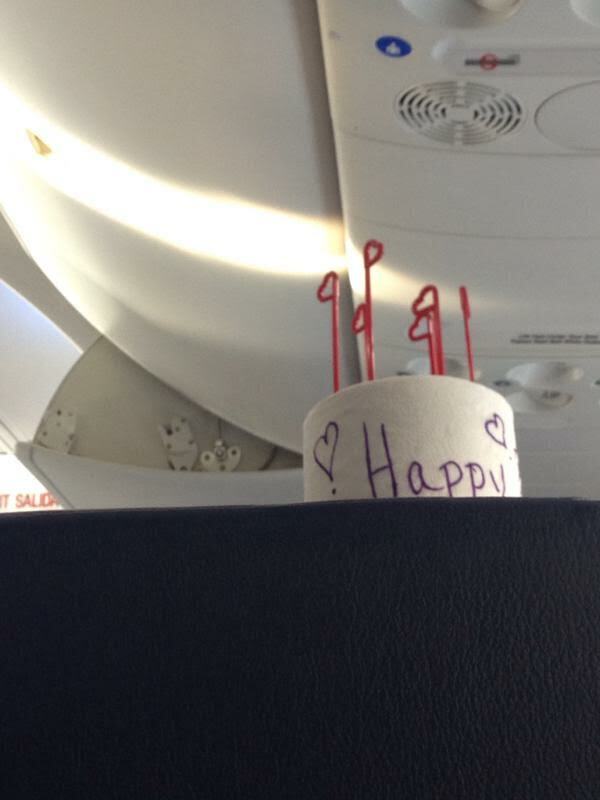 They had written “Happy Birthday” on a roll of toilet paper. This kid had lived through three goddamn years and a thousand-year plane ride through mankind’s darkest nightmares and all she got was a roll of toilet paper. She was sitting right in front of me with her toilet paper cake, and she was supposed to be happy about it, and I generously cried on her behalf because the angry news man was right: we give kids too much, and it’s ruining America. The toilet paper birthday cake. Cassandra Seltzer is a part-time writer and full-time email-sender. You can point your eyeballs at some of her work at Ligiddy.com, where she is also an editor.